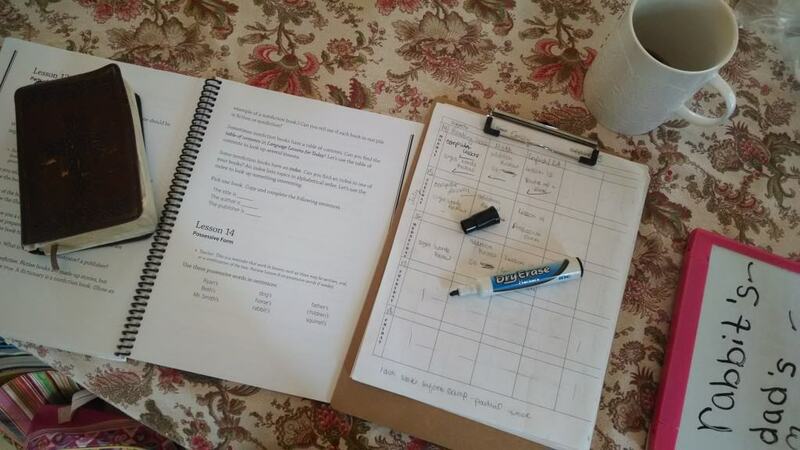 I don’t mind saying it: Homeschooling is Hard! It’s been a crazy month for me in the homeschooling/parenting sphere. I found myself letting out a huge sigh of relief at the end of January, grateful we’d worked through a difficult month without giving up. And, honestly, harboring a little disappointment that our winter semester was off to such a heavy start. I’m an idealist, and “bad” days and “tough” months don’t fit the image of homeschooling that I envision for our family. January definitely fell way off the margin of my ideal homeschooling spectrum! One Friday afternoon, after another crazy school morning, I hopped on my laptop and rather spontaneously posted in my Facebook group for homeschool moms. I pounded out the words in my usual 100-words-per-minute style. I hit “post” and instantly felt writer’s regret. What if I discourage someone because I said I had a tough month? I wondered. I’m a blogger, and bloggers aren’t supposed to complain. I mean, what if that was a bad example? What if this sets off a complaining session in my group? Within a few minutes, the women in the group of 160+ moms began to respond. Tough! For me, January & February are my hardest months. Very tough.. I am struggling fitting in homeschooling, house work, and my job. I’m sticking with it, but seems to be getting more and more tough to juggle it all. It’s rough getting back in to the swing of things for us. It was rough with many frustrations. Very tough. We haven’t accomplished near what I would have liked. Moms need other moms to be real. It’s a noteworthy objective to be a good girl and keep a smile on your face through the tough days. To stick to a lesson plan, try to keep your house clean, not complain about it all. But when the day is over and the books are put away, it’s okay to curl into a quiet corner and cry because you feel overwhelmed and unsure of yourself. It’s also okay to tell another mom, Hey, I’m struggling. This day or month or week or year has been tough. While I’m NOT a fan of negativity or complaining, I’ve discovered that being real with people is very healthy, very healing. And very often it builds a bridge of communication and connection. You’re struggling too? I thought you probably had it all together! This month, I’m reading Sally Clarkson’s new book, The Life Giving Home. 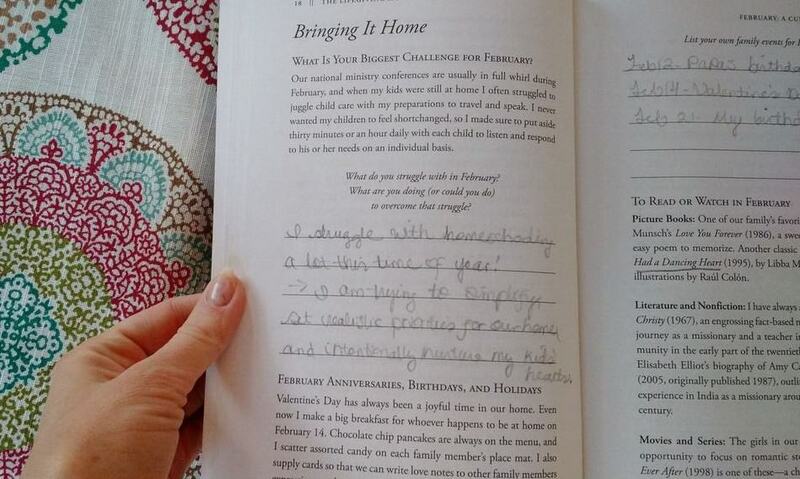 While this book isn’t a “homeschooling” themed book, Sally did raise and homeschool her four children, and I find that her writings always speak to and encourage me in my season of life as a homeschooling mom. It didn’t take me long to pull an answer out for that one! I struggle with homeschooling at this time of year. It’s tough to stay focused, to get the kids back on track after the holidays and in the middle of the winter months. The energy of the new-school-year is long gone, and I just need a fresh dose of inspiration! Somehow, I felt validated by Sally’s question. So she knows that moms struggle in February. Maybe we’re grappling with something at any given time of the year, but each month and each season ushers in it’s own unique challenges. Today I want you to feel validated in your own struggles. Not so you can give up and feel defeated. 1. It’s okay to be real, because you’re certainly not alone in whatever struggles you’re facing right now. 2. The healthy response to every struggle or challenge is honesty and personal growth. Go ahead, be honest with yourself. Say it out loud: This is tough! I’m struggling! I need help! And now ask yourself, What can I learn from this? How can I grow because of this challenging day or season of life? Ask the Lord, What are you trying to teach me? Show me what the next step should be. Maybe the next step is cutting back in a few areas so you can get more rest. Maybe the next step is connecting with other moms who can support and encourage you. Maybe the Lord is teaching you (and me) to embrace His priorities and let go of a few unrealistic expectations. Maybe He’s teaching us to be more organized, more determined, less demanding, less self focused. I don’t know what your struggles are today, but I know it’s okay to just be a little bit vulnerable and admit that you don’t have it all together. Because no one does. Not really. And we all need support and inspiration. Beneath all the struggles, insecurities, and pressures of life, we all desperately crave a safe, life-giving place. So, put your chin up, light a candle, grab a cup of coffee… and let’s do today together, okay? Struggles, messes, to do lists and all… we’ve got grace for today! —–>I’d love to connect with my fellow homeschooling moms over in our private Facebook group! You can join RIGHT HERE. —–>These mid-school year months can be tough! I’ll be posting the top homeschooling articles from this blog over the next few weeks… stay tuned, and subscribe by email so you don’t miss anything! My prayer is that every woman who explores the pages of this blog finds a place to feel understood, validated, and encouraged. How Many Catch Up Days are Okay for Homeschooling? Staying balanced in my callings is a constant struggle. I think most homeschooling moms feel that way, and I don’t think the struggle is going to end while homeschooling. I’m okay with that, though! It’s just encouraging to have confidence that while struggling to balance responsibilities, I also know exactly what God is calling me to do. Oh friend, “balance” is always such a challenge for me, too. And you’re right… it’s a struggle in more than just the homeschooling sphere. I’m so glad you mentioned that. It feels affirming to know that other moms deal with this, too. Wow! I really identify with this post. You are right, homeschooling is very hard this time of year. Especially when the ps has several days off this month. Due to the weather, and not being outside as often, we also struggle with health/tiredness a lot in February. One thing I have to remember, God is good – all the time! Second, to prioritize my time with Him, when I am tired and overwhelmed. Certainly easier said than done. Thank you for this post. Mikki, I love that you mentioned keeping time with the Lord as a priority. I definitely find that my attitude suffers, and our home life suffers along with it, if I do not keep my heart focused on Christ and my mind centered on His Word. I just can’t do it without Him! My biggest struggle right now is being joyful with homeschooling and motherhood when things are hard in other areas of our lives. I so relate, Laura. Thank you for your transparency. I am praying for you! I so needed this post this week! I have had a couple of tough weeks homeschooling as we go back to school here in Australia, and it was so good to read that I’m not the only one! We all struggle, Eliza, and some seasons are more challenging than others. I’m glad you felt affirmed by what you read here. It isn’t always easy being “real” as a mom and blogger, but reading comments like yours keeps me on the right track! 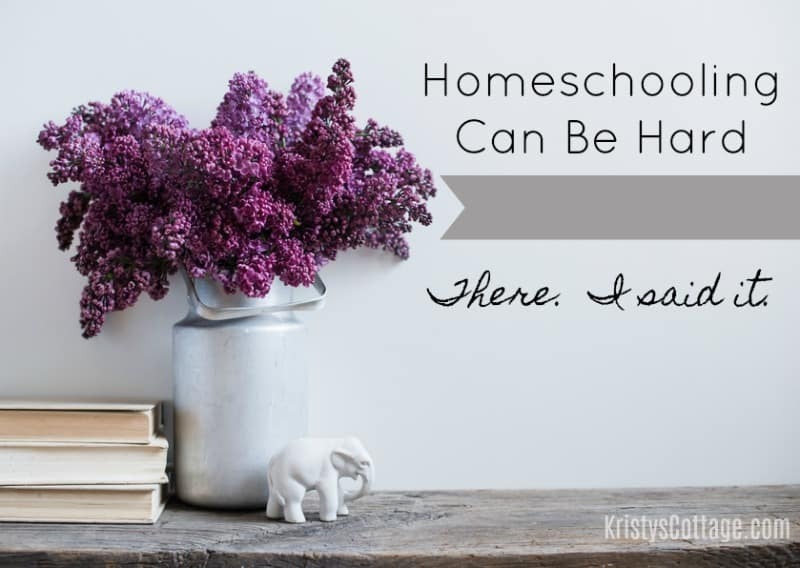 Thanks so much for reading, sharing here, and for connecting over in our homeschooling moms Facebook group. I would love this book! Homeschooling isn’t for the weak! We need the Lord’s strength everyday! Wow! It’s like you were a fly on my wall, watching me. I needed this so badly today. I’m struggling. I have a newborn, and 4 other school age children. I am trying to focus on the new baby and try to homeschool and balance my household must do’s and can wait’s. This blog is so timely for me! Thank you for sharing your heart!